Hagi"- Little Kyoto" SUBPAGE | All Japan Kyoto Association"
Hagi Castle was built by a feudal lord, Terumoto Mori, in 1604. It consisted of the Honmaru (castle tower), Ninomaru (second bailey), Sannomaru (outer part of the castle) and Tsumemaru (castle on the mountain). In 1874, all the buildings such as the donjon or watchtower were destroyed and now only a part of stone walls remains. Today, this well-preserved castle ruin is a well-known place for beautiful cherry blossom viewing. About 600 trees of Somei Yoshino (a variety of cherry tree) and Midori Yoshino (a unique variety of cherry which is designated as Natural Monument of the prefecture) bloom gorgeously in spring. In 2015, it was designated on the World Heritage List as a Site of Japan’s Meiji Industrial Revolution. 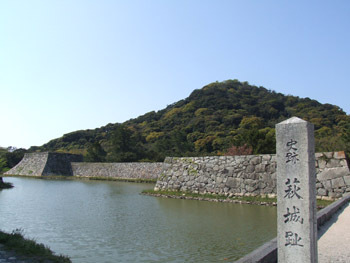 The area which developed as a castle town around Hagi Castle has been designated as a National Historic Site. 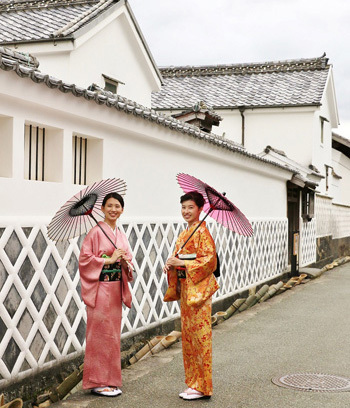 The streets were set out neatly in a grid pattern and old samurai residences and machiya (traditional house) stood in rows, the remains of which are now a relic of olden times. There are some narrow streets called Kikuya Yokocho Street, Iseya Yokocho Street, and Edoya Yokocho Street. In these streets, there are some famous tourist attractions such as a wealthy merchant Kikuya Family Residence, the birthplace of Shinsaku Takasugi, old residences of Takayoshi Kido and Shusuke Aoki, warehouses, gates, and stone walls of Namakokabe (wall covered with square tiles jointed with raised plaster). In 2015, it was designated on the World Heritage List as a Site of Japan’s Meiji Industrial Revolution. Meirin School was one of the largest schools run by the Tokugawa government in the Edo period. 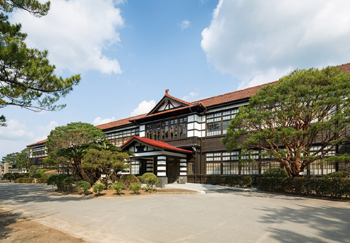 After the Edo period, the site and building were renovated and reopened as the former Meirin Elementary School which was the largest school building made of wood in those days. 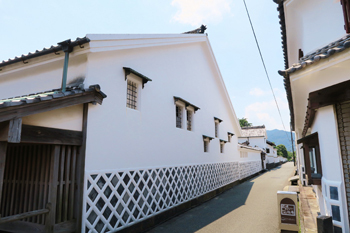 The Meirin Elementary School building (designated as the cultural property of Japan) was reopened as a new cultural and tourist attraction of Hagi in recent years. Here visitors can enjoy dishes using specialties of Hagi in the restaurant. At the World Heritage Visitor Center, exhibits about World Heritage Sites in Hagi are presented. The Bakumatsu Science Museum displays scientific technology developed at the end of Edo period in Hagi. Shokason Juku was a private school of politics at the end of the Edo period housed in a 50-square meter wooden one-storied small house with a tiled roof. It consists of one Japanese-style room with 8 tatami mats and later some rooms were added: one Japanese-style room with 4.5 tatami mats, two Japanese-style rooms with 3 tatami mats, a small earthen floor, and a mezzanine floor. It is designated as a National Historic Site. In 1857, 28-year-old Shoin Yoshida secured this property and opened his private school of politics. He accepted any students who wished to learn regardless of social class. 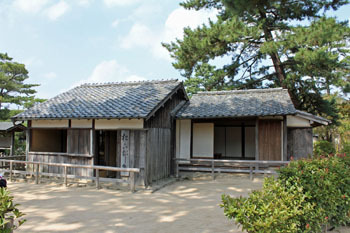 He taught here for only about one year but raised many famous and important historical figures such as Genzui Kusaka, Shinsaku Takasugi, Hirobumi Ito, Aritomo Yamagata, Akiyoshi Yamada, and Yajiro Shinagawa, who served as driving force of the Meiji Restoration and played an important role to start the new Meiji government. In July 2015, it was designated on the World Heritage List as a Site of Japan’s Meiji Industrial Revolution. 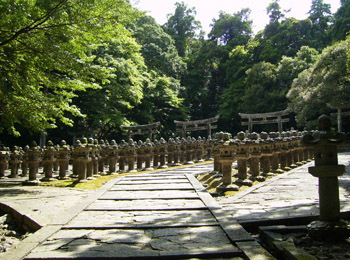 Daisho-in Temple is a Rinzai Sect temple designated as an Important Cultural Property. and was formerly a family temple of the domain lord of Hagi. The Kuri, or temple’s kitchen is large and its appearance is suitable to serve as the family temple of the domain lord. 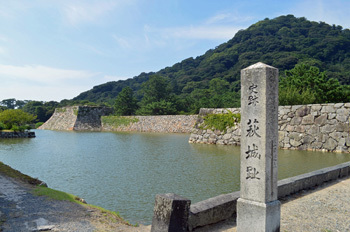 The tombstone of Hidenari Mori, the first lord who ruled this area, can be found here as well the graves of several other successive lords of the Mori Clan and their wives’ graves. In front, are approximately 600 stone lanterns donated by local feudal lords. Toko-ji Temple is one of the greatest temples of the Obaku Sect. It was built by the third-generation local lord, Yoshinari Mori in 1691 and is a family temple along with Daisho-in Temple. 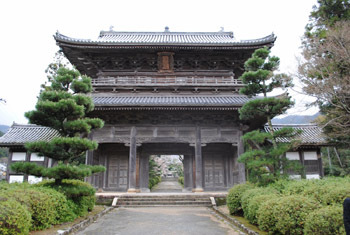 So-mon Gate (main gate), San-mon gate (temple gate), a large bell, and Daiyuho-den Hall are all designated as Important Cultural Properties. The large graveyard belonging to this temple, at the back side of the Main hall, is designated as a National Historic Site. In the graveyard, there are some tombstones of the former local lords and their wives. In front, are approximately 500 stone lanterns contributed by the local feudal lords. 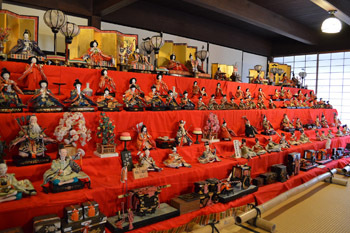 Various kinds of Hina Dolls (traditional doll set for the girl’s celebration in March) are exhibited. On the last two days of the festival, Nagashi-bina (floating Hina Dolls on the river) event is scheduled. Approx. 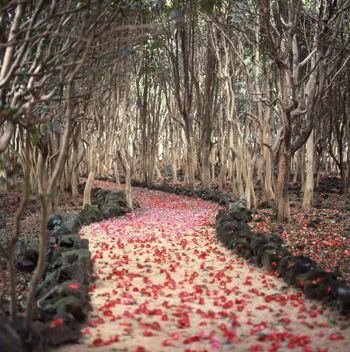 25,000 camellias growing wild on Mt. 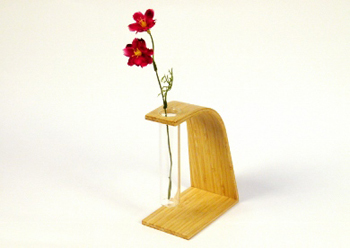 Kasayama flourish colorfully and will captivate visitors. Roadside Stations "Hagi Sea Mart"
The best seasonal product of Hagi in this season is ice fish (Shiro-uo). 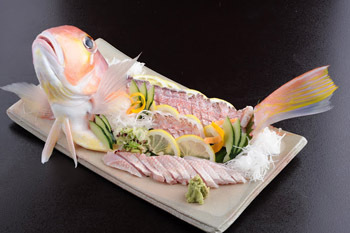 In particular, eating live ice fish is a must-try. 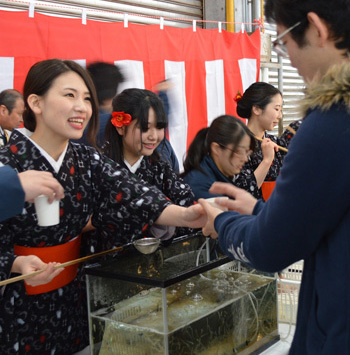 An event in which people can enjoy wearing kimono and strolling around Hagi City. 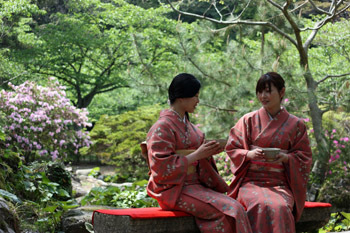 This is an annual tea gathering event held in the first week of May at the remains of Hagi Castle and Shigetsu Park, etc. 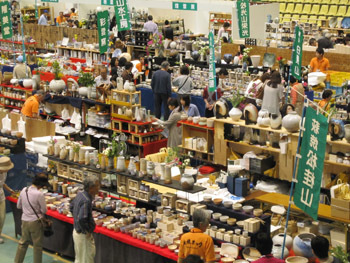 Many visitors come to buy Hagi pottery or products of Hagi. Also, people can try making pottery on a wheel. 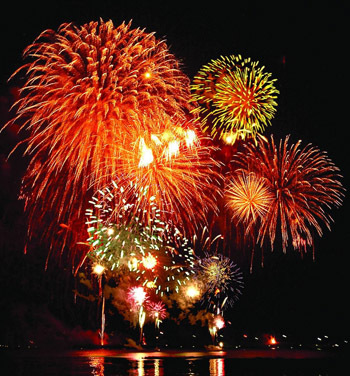 This is a summertime dream with beautiful fireworks at Kikugahama Beach, the best location along the Japan Sea’s coast! This is a big summer event in Hagi. 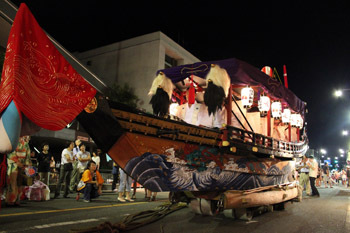 Many events are held such as the traditional Sumiyoshi Mikoshi parade (portable shrine) or the Ofunauta traditional ceremony (designated a prefectural intangible folk cultural asset) and so on. This is a festival featuring fish. 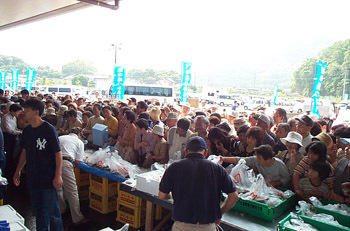 People can buy fresh seafood caught around Hagi. Children can enjoy “scooping fish”. This is an autumn big event in Hagi. The Daimyo parade goes around the city. 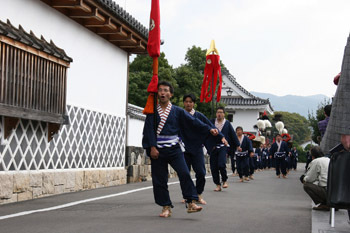 This traditional event has continued for about 290 years. 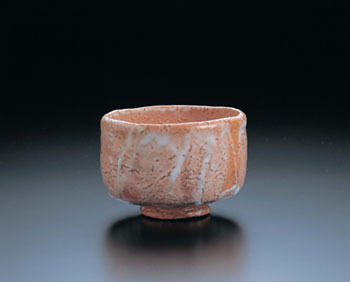 “First, Raku, second Hagi, third Karatsu.” As this old saying goes, Hagi-yaki Pottery with its simple shape and decoration has been valued and praised by many tea ceremony masters. With its absorbent property, the color slightly and gradually changes after being used for a long time. This phenomenon is called “Cha-nare” and is highly valued. 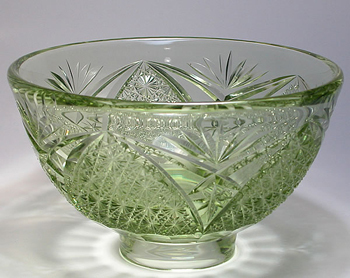 In the Choshu Province, people started to manufacture glass from the end of the Edo period. This light-green glass is harder and stronger than common glass since it is refined from raw stones of basalt rocks excavated on Mt. Kasayama in Hagi. Yamaguchi Prefecture is one of the top ranked prefectures covered by bamboo forests. Around Hagi City is a famous production area since the city has approximately 12000 ha of bamboo forest. The temperature difference of this area is quite extreme which results in bamboo growing strong and thus Hagi products are made of good quality bamboo. 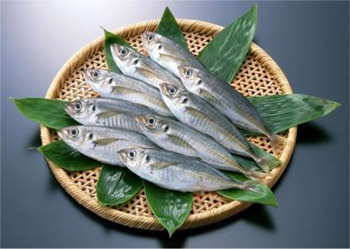 Setsuki Aji, a kind of jack mackerel, grows well by eating good and nutritious food and they become very fatty and firm-textured. Fresh Setsuki Aji are caught every day in the sea around Hagi. Amadai, tilefish are caught around Mishima Island which is located offshore of Hagi. 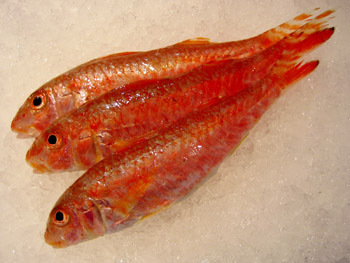 It is very fresh and valued as a high-quality fish. Yamaguchi Prefecture has the best haul of tilefish in Japan. This is a unique local dish, and nothing similar can be found in other regions. Through four seasons, it is indispensable dish in this region for ceremonial occasions and banquets. 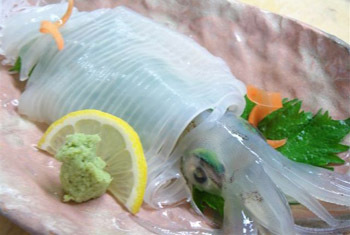 Mainly from April to December, swordtip squids are caught by pole and line fishery in the area along the coast of Yamaguchi Prefecture to offshore of Hagi. They also have another name; “white squid”. You can eat them with sashimi or tempura. This is one of the most popular Hagi products which has been produced continuously from the era of the first feudal lord, Hidenari Mori (1595-1651). 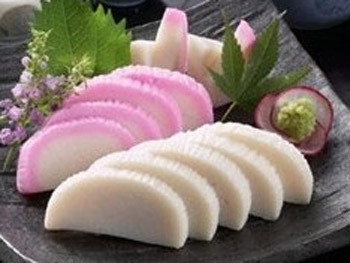 It is said that Hagi is the originator of this kind of Kamaboko fish cake. 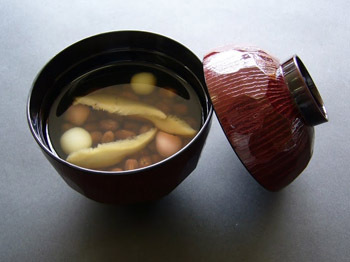 The cooking method called Yakinuki (baked on a low heat from the bottom) is a feature of making this product. cows who are the original Japanese breed, and Holstein. 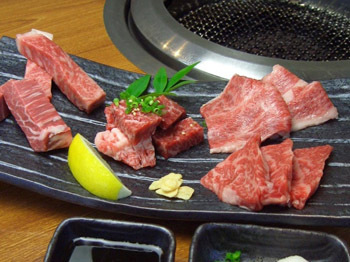 This high-quality beef continues the characteristic traits of the fat-marbled beef of the Mishima Island cow. 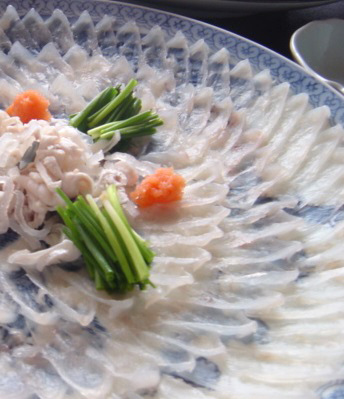 Yamaguchi Prefecture is the best prefecture to enjoy Hagi pufferfish, or Mafugu. The fish meat has a vivid amber color, tender texture and delicious taste. Torafugu is “King of pufferfish” and Mafugu is “Queen of pufferfish”. Sengokudai, a plateau in Hagi City, has fertile andosol and a cool climate at its 400-500 meters high altitude. 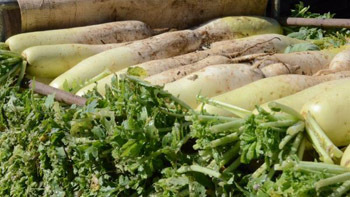 Thanks to this geographical advantage, Sengokudai is the biggest place of production for white radish. The radish is brought up with great care by farmers and is highly valued because of its freshness and sweetness. Kintaro is another name for goatfish which has been familiar with local people since a long time ago. The soft white fish meat with a rich and sweet flavor has a superior taste to king size white fish. It is suited to various cooking styles.